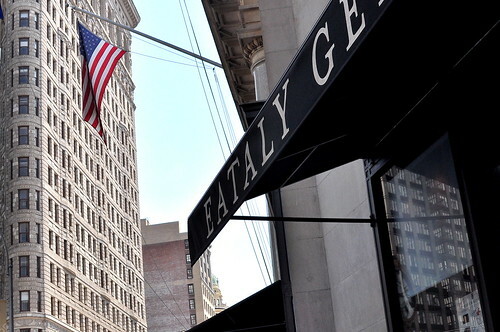 Before departing New York City for the temperate pastures of Los Angeles, The Astronomer, Cousin Jackie, and I grabbed a quick lunch at Eataly. The Italian food hall, which is modeled after the original Eataly in Turin, boasts 36,500 square feet of gustatory and sensory pleasure. The folks behind this temple of Italian food are none other than restaurateurs Joseph Bastianich and Mario Batali. Man, these guys sure have their fingers on the pulse when it comes to feeding the masses all things Italian. The humongous space was crammed with people of all stripes during lunchtime, which made navigating the various restaurants and stands less pleasurable than I would have liked. While I don’t mind standing elbow to elbow with strangers on the subways and streets, I’d much rather not have to fight for my lunch. Our initial plan was to dine at La Pizza & La Pasta, but the hour-long wait didn’t fit into our schedules. 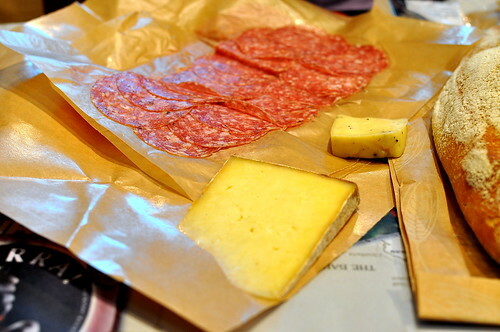 Instead, we dined picnic style on various meats, cheeses, and breads that we procured throughout the market. 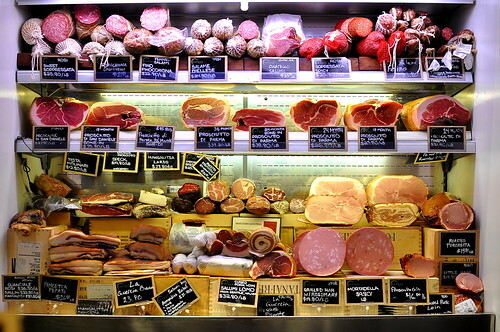 My favorite stop was at the cured meat stand. The man behind the counter was knowledgeable, opinionated, and offered up plenty of samples to guide our taste buds. 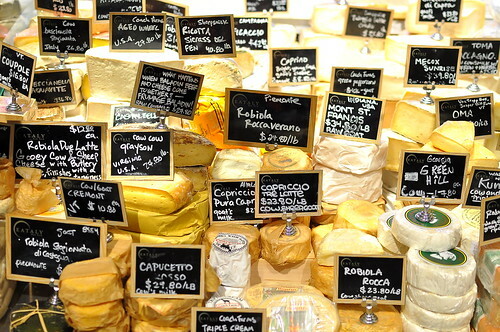 The cheese counter was equally robust, with over 400 varieties of regional Italian cheeses. Our final stop was at the bread counter, where we procured baguettes and focaccias. 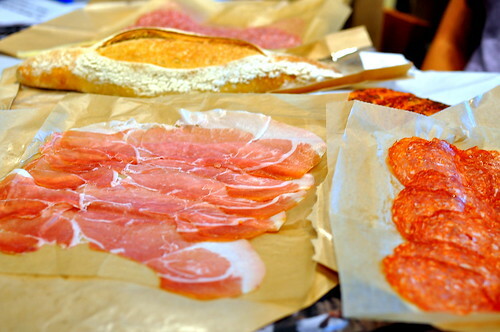 All of Eataly’s breads are made by hand from organic stone-ground flour and natural yeast. The breads are baked in an imported wood-burning oven. 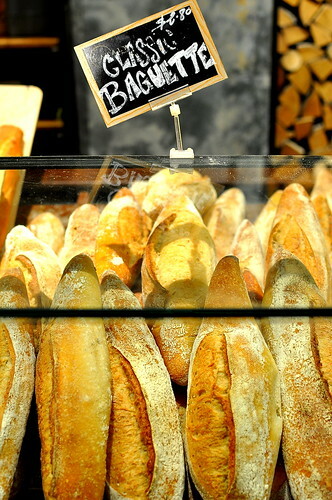 The entire bakery operation is overseen by Chef Nancy Silverton of La Brea Bakery and the Mozza restaurants in Los Angeles. The sopressata, which was made of coarsely ground Berkshire pork shoulder, was mildly spiced and everything nice. We also really liked the sweet and salty aged prosciutto made from Italian piggies. From the cheese monger, we purchased a large wedge of “landaff” raw cow’s milk cheese and a teeny tiny wedge of “caciotta al tartufo.” Jackie and The Astronomer polished off the mild tasting “landaff,” while I focused on the semi-soft and smooth sheep and cow’s milk cheese studded with black truffles. We ate what we could in the time we had at Eataly and made tidy cheese and charcuterie sandwiches with our leftovers for the plane ride home. It wasn’t the final meal in the city that I had initially hoped for, but the makeshift Eatalian spread was a satisfying feast nevertheless. Can’t wait for Eataly to open here in LA! I bet all your planemates were horribly jealous of your Eately snacks! Holy crap, I wouldn’t have known where to even THINK about beginning! FOUR HUNDRED cheeses? I would die of excitement and overwhelmed-ness. I’m so glad you went! Justin and I haven’t braved the crowds yet, but we just might have to do just that on our next trip now that I’ve seen what we’re missing! Effing – I zoom into every photo that I take to make sure they’re all tack sharp—things can look one way on the little camera screen and a whole different way when downloaded onto the computer. I make sure my shots are sharp on the scene and retake if necessary. Post processing? I use Picasa and adjust the brightness and shadows.